Walter Hill’s cult classic is tacky, overflowing with clichés and relentlessly over the top, it is also strangely brilliant. 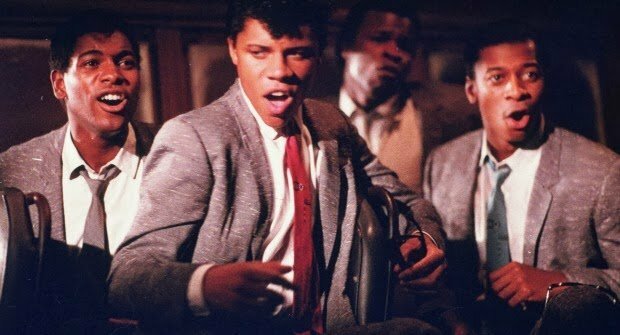 The director himself said he wanted to make the kind of film he would have loved as a teenager, filled with “custom cars, kissing in the rain, neon, trains in the night, high-speed pursuit, rumbles, rock stars, motorcycles, jokes in tough situations, leather jackets and questions of honor”. 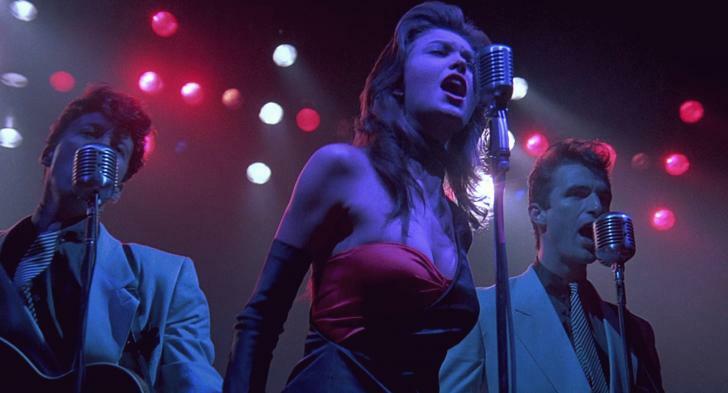 Streets Of Fire encompasses all of these facets, bathes them in neon and blends them into a storming rock and roll fantasy. The plot itself is a thing of simplistic beauty. A beautiful rock star, Ellen Aim (Diane Lane), has returned to the mean streets of her hometown to play a gig. During her triumphant performance however, she is kidnapped by The Bombers, a leather-clad biker gang led by the snarling Raven Shaddock (Willem Dafoe). Back into town rolls the mysterious Tom Cody (Michael Paré), a no-nonsense loner and one time love of Ellen. After befriending a tomboy ex-soldier called McCoy (Amy Madigan) and stocking up on an arsenal of weapons, Cody is hired by Ellen’s manager and new boyfriend Billy Fish (Rick Moranis) to go into The Bombers turf and rescue her. From here it’s a straight up modern day Western as the posse of good guys are forced to fight their way to safety through unforgiving and violent streets. It would have been so easy for this film to take itself too seriously and just turn out as pure unwatchable schlock, but instead it’s an unabashed thrill tide from start to finish, The plot is purposeful silly and the characters deliberately thinly drawn archetypes, but the action unfolding is so enjoyable bonkers, you just let it all wash over you. 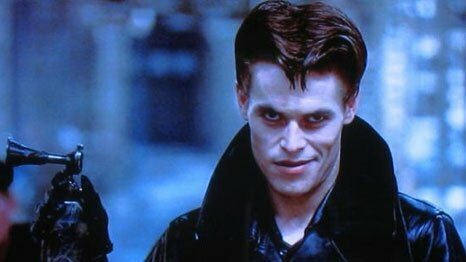 Several of the cast went on to bigger and better things, Dafoe and Lane in particular, but it’s surprising that Michael Paré never went on to become more of a name. Perhaps if the film had spawned the sequels the director had originally intended, it might have been a different story. Paré is a combination of the typical Western man of few words and a quip-laden 80s action hero, delivering ice-cool lines like “they always hire bums like me for jobs like this” with aplomb. Director Walter Hill’s other tribute to the gritty hyper-real life on the streets was The Warriors, and while the two films do tread noticeably different paths, there are some obvious crossovers between the two. The tough talking hero, the highly stylised gangs, dingy city streets and a band of heroes dodging bad guys and the law as they fight their way home. This time out, the director combines 80s rock-chic with a retro 50s greaser aesthetic and the end product is a rock and roll melting pot that, as he originally intended, can’t help but appeal to the inner teenager in you. The film’s title was taken from the Bruce Springsteen song of the same name, and it’s fitting that those icons of Americana that Bruce so loves to sing about, the car, the tough street life, bikes and the loner leaving town, are so well captured here by Hill. Springsteen had originally allowed his song to be used in the movie but changed his mind when told it would be someone else performing it on the soundtrack. Instead, we have a bombastic rock opera that included songs penned by the mighty Jim Steinman, which is apt as the film itself play out like a low-budget Meat Loaf video. Song titles like “Tonight Is What It Means To Be Young” and “Nowhere Fast” fit the tone of the movie perfectly and turn it into a strange musical/action/romance hybrid, which is every bit as brilliant as it sounds. New-wave outfit Face To Face appear as Ellen’s backing band The Attackers and for Ellen’s singing voice a combination of The Attackers front woman Laurie Sargent and vocalist Holly Sherwood was used, under the auspice of ‘Fire Incorporated’. I could go on about the soundtrack all day and haven’t even mentioned the glorious doo-wop stylings of The Sorels yet, but I’ll simply say it’s as fittingly OTT as one might hope, and leave it at that. The film bombed on release and made $8million, only just over half of its production budget. It is in a way understandable why it wasn’t immediately embraced by the public as it’s certainly not a film for everyone. Some may find it just too overblown and cheesy to handle. 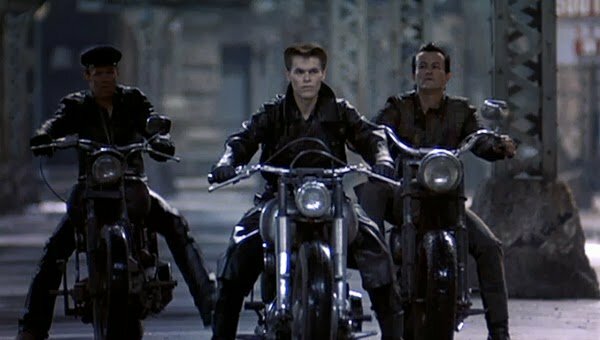 However, if a 1980s set rock-opera set around gun-toting street toughs sounds exactly like your cup of tea, Streets Of Fire will be the visceral adrenalin rush you’re looking for. It’s even got a pick-axe duel for god’s sake. The Blu-ray transfer is not great, there are some grainy moments along the way, but the extras are pretty enjoyable with an exhaustive featurette entitled ‘Rumble On The Lot’ a particular treat as cast and crew take a look back at the making of the film. Streets of Fire was released on blu-ray 18th November 2013.